The French commission of the BAAM organizes free French classes in Paris and its suburbs. Classes are held in various places such as public libraries, cultural centers and on the street. Depending on the context and needs, our work takes the form of literacy classes, French language course and conversation workshops in pair with a French speaker, or “Tandems linguistiques”. You’re welcome to join any of our classes with still room for new students! French language courses are free and without registration. They are open to beginners and all other learning levels. The document is free to print and distribute. In order to resume university studies, directly fill in the Resome registration form. Map of libraries in Paris and Ile-de-France for self-study: CartO-FLE Ile-de-France (in French). In yellow, books and online resources to study French. In blue they offer conversation workshops in addition to self-study resources. Resources to other structures: The Network-Alpha search engine is a directory of structures offering French classes in Ile-de-France. Call structures for availability. Classes are also available through the Paris CMA, city program of courses for adults. You speak and write French? Over sixteen weekly classes are now taught in Paris and its suburbs, trying to fill a growing and complex demand. We are always looking for facilities and teaching materials (notebook, pens, veledas). We are looking for motivated volunteers to give French lessons and literacy, and support us in the development and coordination of the project. Join our Facebook group discussion: Bienvenue chez toi. To volunteer as a teacher for Bienvenue chez toi, join us and send an email at baam.francais@gmail.com. See the page in French for more details and educational resources. Email us directly at baam.francais@gmail.com for any other question. 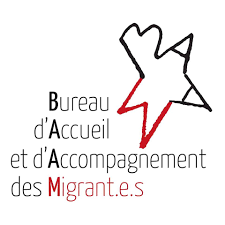 Volunteers at the BAAM can connect migrants with French speakers in pairs to form conversation tandems, so they can practice French and talk about life in France. The BAAM has already formed more than 200 tandems since October 2016!